Good news to anyone that’s into Otaku type news, and doesn’t read Japanese. This morning while I was browsing Android’s Dungeon I noticed he had a post announcing that AkibaBlog.net was now in ENGLISH! 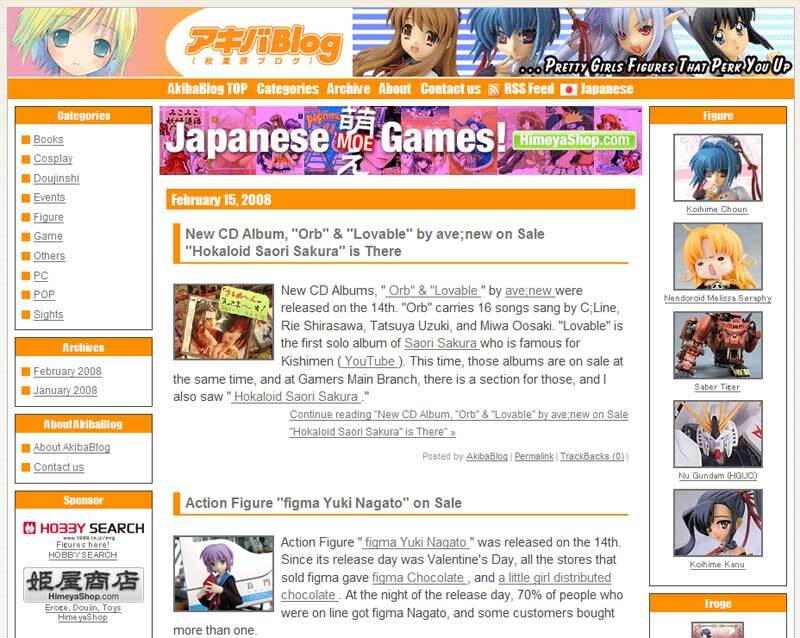 That’s great news because AkibaBlog is considered to be the largest Otaku blog in Japan! I have posted a few summaries of their stories in the past because I realize most of my readers don’t speak Japanese, but now everyone can enjoy all that is AkibaBlog. I’ve always seen that little “English” link in their toolbar, but it was password protected. So I figured the owner was only giving some users access to their English portion for translation purposes. However now I realize that it must of not been finished and thats why there was a password. Whatever the case, head over to AkibaBlog and be amazed.